In the heart of the Willamette Valley is the town of McMinnville. In the center of McMinnville is downtown; and throughout downtown, you’ll find a group of wineries and tasting rooms calling themselves the McMinnville Downtown Wineries Association. Although tourists won’t find vines or palatial wineries, they think of “Downtown Mac” as an essential part of Oregon wine country with a number of award-winning restaurants and quaint shops around every corner. Focus? The McMinnville Downtown Wineries Association is designed to uniformly promote, advertise and network the urban McMinnville wine-producing businesses. MDWA is a nonprofit organization operating under 501(c)(6) guidelines. Identity? MDWA include some of the first established Willamette Valley post-prohibition wineries and some of the latest cult wine producers. All wineries are within a few blocks from one another. Before this was considered a cool new trend, the original members of the MDWA were already operating in an urban production setting, within McMinnville downtown limits. 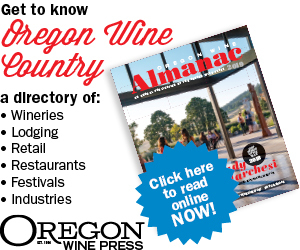 Today, a total of 11 wineries call downtown McMinnville home. Each member shares the same passion. Members trade ideas, resources, and equipment. Combined, they offer an amazingly rich and diverse portrait of today’s Oregon wine industry. Varieties? Varietals range from the Oregon classics to more obscure and unique ones. Members grow their own estate fruit or source them from within the Willamette Valley, Southern Oregon and Washington State. Visitors to these 11 wineries and tasting rooms can sample Pinot Noir, Pinot Gris, Chardonnay, Riesling, Pinot Meunier, Viognier, Syrah, Lagrein, Pinot Blanc, Muscat Ottonel, Baco Noir, Roussanne, Tempranillo, Sangiovese, Barbera, Port and sparkling wine. Collaboration? By definition, this nonprofit group relies on members’ collaboration, and each member volunteers time and resources to the organization. Challenges? There are not enough hours in a day… This is already quite a valid challenge for most typical small-size, family-owned Oregon wineries. When you add tasks associated with an all-volunteer nonprofit, you pretty much double the same daily challenges. Marketing? We are using traditional as well as new support, which relies on social media or Groupon/Living Social-type of promotional venues.